After an eLearning project has been designed and developed, there’s one more thing that needs to be done – somebody needs to check that everything looks and works as it should. If this tricky and responsible task falls under your duties – welcome to the club! I also often help with testing eLearning courses, so I’ve decided to share a few basic things that you should always pay attention to. Start by checking everything that’s text-related. This includes several items. First, you have to make sure that the content in the course matches the script – everything’s where it should be and nothing is missing. There can also be cases where the amount of text isn’t appropriate for the particular page layout, so either the content or the layout may have to be adjusted. Consistent indents, text alignment and spacing. And, finally – try to look out for any spelling or punctuation mistakes that might annoy and distract your learners! Position and size of images. Needless to say, you need to be extra-careful if the project in question happens to be responsive – some unpleasant surprises may await when you pick up that tablet or mobile phone. And then comes the functionality. This means making sure that everything actually works – navigation, menu, buttons, links, video and audio, interactive tasks, content resets, test reports… the list can go on and on, depending on the complexity of your eLearning project. When it comes to functionality, the golden rule is – try to break everything. Of course, you should see if everything goes smoothly when you go through the training ‘correctly’. After you’ve done that – go wild! Click everything, try everything, jump back and forward, leave something open and go back to check if it’s still open (should it be?). In other words, your new motto now is “I really shouldn’t do that, but – what if I did?” Doing unpredictable things is the only way to catch some pesky bugs that you would never notice going about the course ‘the decent way’. As with any new task, testing an eLearning course can seem confusing at first. I hope that my suggestions will help you develop a strategy for testing your projects more efficiently. The good news is – testing really gets easier with every time you do it. Of course, eLearning is always changing and developing, so new challenges are sure to arise. However, after having tested several projects, you will probably already have a system in place that will allow you to spot the most common issues with ease. 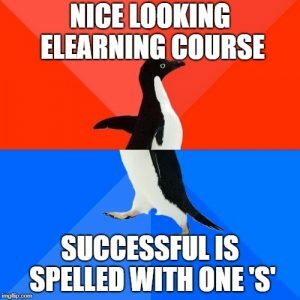 Sometimes even after a few weeks of publishing we find something that has slipped our eye while testing our e-learning templates. And that is totally normal. Browse through our templates and try to find something misplaced or out of ordinary. Found it? Good! Let us know, so we can improve. Click the button below and browse through our e-learning templates!